Address: OUT OF BUSINESS ??? 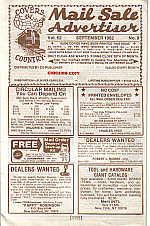 Description: Mail Sale Advertiser USA est.1930 - the original publisher Vanroy W Shirk, Box 55, Lebanon, PA 17042, USA - was the greatest mail order magazine available for co-publishers in the 60's etc, letter press printed 6x9, 24-48 pages, circulation from 10.000 to 30.000 monthly. I advertised in and co-published some issues with the help of my US penpal. MSA did NOT accept foreign co-publishing orders and therefore my copies were at first sent to a US address from where they were forwarded to Finland. Vanroy did print my name & address as the co-publisher anyhow. I've got the offset printed MSA issues 5 and 9 of 1982 and at that time the publisher had changed, the new publisher was Steven H. Warner, PO Box 354, Huntingdon, PA 16652, USA. 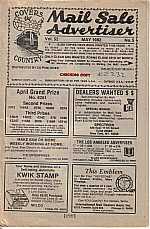 The May 82 issue was mailed by 160 co-publishers in USA, 19.350 copies printed. I don't know which issue was the last ever printed !